Consumer Food Products organizations are closely following the price of oil. Two main ingredients of Food and Drink consumer products organizations are sugar and corn. The price of these two commodities in the world market dance in tandem with the price of oil. Is it because, increase in price of oil increases processing cost for food organizations? It is true to some extent but food processing units are not energy guzzlers like aluminum, steel or cement producers. Hence this is not a strong reason. Is it because disposable income of people drop as they might spend more on oil? As a result people might have less disposable income for food, which might result in a drop in demand. That could be a reason but there is a stronger reason. 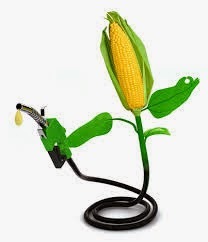 As price of oil increases ethanol mix or biofuel become more economical. This means more of corn and sugarcane will be used to manufacture ethanol which goes into mixing with gasoline. Less of corn and sugar is available for manufacturing of food products hence the price of these two commodities in world markets also increase.